In the last post, The Molsons, builders of our heritage (#346), we looked a little bit at how the Molson family played a huge role in building the city of Montréal. They played a direct role in the city’s industrialization and development; perhaps more than any other Montréal industrialist family in a period of 200 years. Much of this helped to give Montréal the foothold it needed to extend its sphere of influence further afield, much further afield. Up until the mid-1900s, Montréal was the “nerve centre” of the Northern half of the continent (Canada). After prior waves of New France explorers and Voyageurs into the West, It was from Montréal that the real push for the West began. Just as the push to populate and build the US West came from the major Eastern US cities, much of the push to populate and build the Canadian West came from Montréal. So let us fast forward beyond the Voyageur era to the last half of the 1800’s and into the early 1900’s. In Western Province history text books, a lot of time is spent talking about the Canadian Pacific Railway (the CPR) and its effect on the growth of Western Canada (believe me, I can still vividly hear in my head the voice of my former history teacher, Mrs. Savoie, reading year after year from the pages of Alberta’s history text books about the CPR, and how it did this, and how it did that, and blah blah blah). The emphasis was always on where the CPR was going, but not where it came from. There was little discussion on its “source”, and how that “source” played a role in shaping the destination (in terms of mentalities, experiences, and dreams for the future). What people were not taught (and are not taught) is that the source was Montréal. 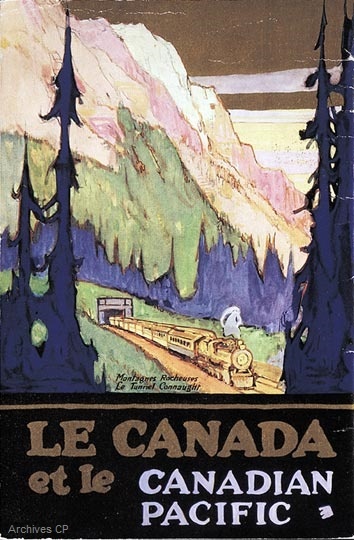 People embarked on those trains from Montréal to build the West, taking a part of their own backgrounds and dreams with them. In the beginning, the lingua franca of the West was French, and it remained so until the later 1800s. Even when the West’s language shift began to occur, Eastern Canada’s (and Québec’s “source land”) influence and drive to build the West did not diminish. A few days ago, the program “Le 15-18” on Radio-Canada Première came out with a very interesting radio interview program, styled as a short magazine episode. It talked much about the above, and delved into matters such as Louis Riel and other twists and turns taken during the Montréal-driven building of the West. When we talk about Canada in today’s modern context, we often talk about how various regions of the country symbiotically influence other regions (in the sense that we are growing from what one region offers to another region). Yet, surprisingly, we rarely talk about our shared past — one which makes us what we are, and who we are today. I thought this might be an very educational piece to present in this blog post. For those of you learning French, try to follow along. It is spoken at a fair pace, but the language used is very standard French (meaning there should be little in the way of slang or colloquialisms to throw you off). The program’s intro can be READ by clicking the IMAGE below. (2) CLICK “AUDIO FIL” to listen to the radio portion and interview. Both are very interesting and well done. As a sidenote: When they’re talking about the “American West”, they’re referring to the West of the (North) American continent (not the U.S.A. per se). This is actually where we see a difference between Canadian French and English. America/American often refers to the continent in French, whereas in English it is often associated with the U.S.A.
By Quebec Culture Blog 101 in Uncategorized on September 2, 2015 .